I was up shooting approaches this morning with my favorite CFI and we saw a pretty amazing thing on the ramp when we got back. 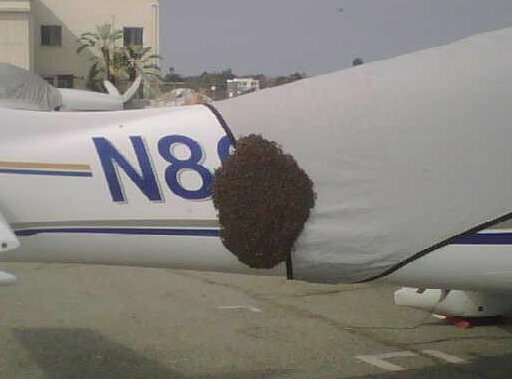 A swarm of bees was attached to one of the aircraft parked on the ramp, in full on “protect the queen” mode. That whole dark patch is bees. I hope for the owner’s sake that the bees are just moving the hive somewhere and that they haven’t decided that they’d rather have a moving base of operations. Man, what a potential nightmare. Practical matters aside, I’d really hate to have this happen. When I was younger I had a serious phobia about stinging insects – I sat on a hive full of ground-based bees at an impressionable age. I’m pretty well over that now, but I still wouldn’t like have to deal with a hive in the Archer. This entry was posted on Sunday, March 25th, 2007 at 5:08 pm	and is filed under blogbook. You can follow any responses to this entry through the RSS 2.0 feed. Both comments and pings are currently closed. Oh. My. I’m going to hose EVERYTHING with wasp and bee killer for the foreseeable future.